Looking for a way to promote Lent Madness in your congregation’s newsletter or local newspaper? You’re in luck! Below is a FREE article about Lent Madness 2017 — no strings attached (well, besides the harp strings of the heavenly angels). But that’s not all! The Supreme Executive Committee is also tossing in widgets for your parish or personal websites ABSOLUTELY FREE. Click here to download your FREE widget. If you have no idea what a “widget” is, just ignore this paragraph. Of course, while you can purchase a copy of the Saintly Scorecard or Bracket Poster, there is no purchase necessary to participate in Lent Madness. You can even download the 2017 Bracket for…wait for it…FREE! Finally, if you would like Lent Madness graphics to accompany this article or to share on social media, you can download the ones here for…FREE! Proving, once again, that sometimes the best things in Lent are free. Are you looking for something fun to focus on? Are you longing for inspiration and joy? For the eighth year running, people of faith are gearing up for Lent Madness, the “saintly smackdown” in which thirty-two saints do battle to win the coveted Golden Halo during the season of Lent. 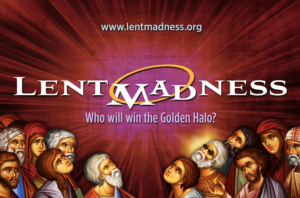 With its unique blend of competition, learning, and humor, Lent Madness allows participants to be inspired by the ways in which God has worked through the lives of saintly souls across generations and cultures. Based loosely on the NCAA basketball tournament, this online devotion pits saints against one another in a bracket as voters choose their favorites throughout the penitential season of Lent. This year’s competition begins on “Ash Thursday,” March 2. This year Lent Madness features an intriguing slate of saints ancient and modern, Biblical and ecclesiastical. 2017 heavyweights include Joan of Arc, Martin Luther, Florence Nightingale, Stephen the Martyr, and Sarah the Matriarch. It also includes several intriguing matchups including Augustine of Hippo vs. Augustine of Canterbury (All-Augustine Anarchy); Fanny Crosby vs. G.F. Handel (Battle of the Bands); and Joseph Schereschewsky vs. Nikolaus von Zinzendorf (Clash of the Consonants). 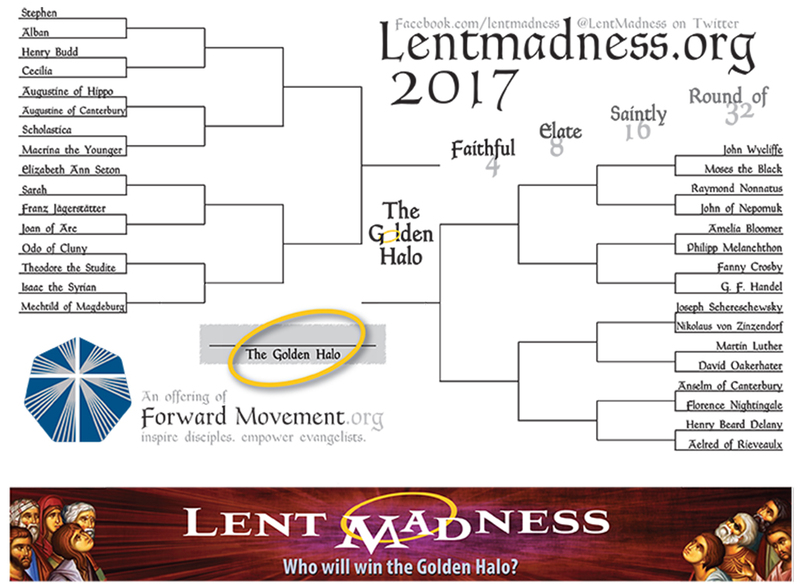 The full bracket is online at the Lent Madness website www.lentmadness.org and, while not necessary to participate, you can order the Saintly Scorecard: The Definitive Guide to Lent Madness 2017 at www.forwardmovement.org. This companion guide includes biographies of all 32 saints, a full-color bracket, information about how to fully participate, and a series of Pocket Lent trading cards. The formula has worked as this online devotional has been featured in media outlets all over the country including national television, the Washington Post, NPR, USAToday, and even Sports Illustrated (seriously). More importantly thousands of people have been inspired by the saintly stories of those who have come before us in the faith. 20 Comments to "Free Lent Madness Stuff!" I get your Lent Madness on my regular email, but I need it also in a form that I, as moderator of our church FB, I can post there also. I can’t wait! I have learned so much by participating in Lent Madness. Just looked at this year’s bracket. Lots of names I am not familiar with. I’m looking forward to finding out about these saints of the Lord (and having fun!). God Bless, St. MARK will win. Would the Supreme Executive Committee please comment on why there is not a totally fresh field of contenders each year….Why some saints are getting a do-over? A) Because we’re supreme. B) See A. Actually, we do have some guidelines around this which we share as we accept nominations after Easter. 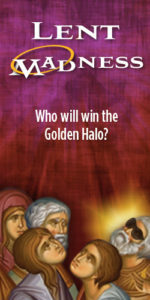 Golden Halo winners are never again eligible and if a saint has gotten to particular rounds they aren’t eligible again for a set number of years. I have now tried five times to enter my email address so I can get the daily offerings by email. Everytime I do, I get a message that says that email address has opted not to receive email subscriptions, which isn’t true. I went to the blog place to make sure Lent Madness was in there, and it was. But I can’t get it to allow me to subscribe. Can you please subscribe me? My email address is below. Thanks. Got my package of scorecards and Big Bracket today and am taking them over to church tomorrow! Looking forward to learning about new folks and seeing if there’s new information about former contenders. We use Lent Madness to drum up donations to the food pantry we support. For example, in the first round, winning pick = 1 box of cereal, a losing pick = 2 boxes. (Last year we did soup in the first round, but some of our volunteers hurt themselves lugging over 100 cans of soup to the pantry). Can I add a paragraph to the article about the food collection before sending it to our local rag? That’s awesome, Vicki. Please do! And send us a link. I am really looking forward to this website this Lenten season. With so much going on in the political sphere that I fear is undermining our democracy and the .undermining of the progress (such as it is) we have made toward being a more inclusive people, I am going to need all the inspiration I can find…not to lose heart, not to give up, yet trying to maintain a loving and accepting heart towards those who are marginalized-that is the easy part. But also, to stand up for equal rights for all of God’s children. To stand up and be counted for what is right, loving, kind, just, and of God. Am so excited to see Elizabeth Ann Seton on here. I only found you a few years ago and I haven’t seen her here before (maybe she was here early on, before I found you). I went to St. Elizabeth Ann Seton High School in South Holland, Illinois. At the time it was an all-girl prep school (it later changed to co-ed). I know, that was a long time ago. Ha ha. I graduated in 1977. Not only did I have the best education, I had fun too. Uniform shirts, weskits, and saddle shoes. Great times and I made friends for life. A core group of about half a dozen of us are still friends today, 45 years later and stay in touch. It was wonderful and freeing. At a time when it still wasn’t that cool to be a girl and be smart, being an all-girl environment gave us a freedom to excel and compete and strive for excellence. Even though I am a devout Episcopalian I can’t say enough about the value of a good single gender Catholic high school. This year I am going all in for Lenten Madness and am going to force my parish to do the same! The the usual call to provide “something” for Sunday Lent Education, and the usual response that the same two people show up with others making surprise appearances, I thought I would do something that is not too labor intensive to present. Though I know some parishes add in personal saintly visits, etc. – I would love to know other ideas and resources (like the food collection one above). 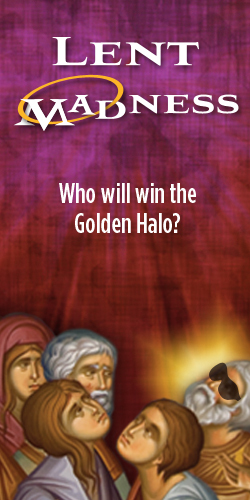 I am wondering if I just do a recap on the week before each Sunday and then look at some of the races ahead…or do we do our own voting and award our own golden halo? Would love to hear what others have done with this. Has the Supreme Executive Council taken steps to assure that the Russian government will not interfere with this year’s voting process? Otherwise, there may be an unexpectedly high number of votes for Joseph Schereshewsky. He’s fantastic. His Golden Halo will have to be extra large. Huuuuuuuge. I am drumming up business at our parish for Lent Madness!!! Thank you Peter for that laugh. Everyday something new to rant about. Nice to get a laugh out of things instead.